For years I have known that the Son of the Most High’s name could not truly be “Jesus” as that is an English name and common sense would say that when He walked this earth, his family, friends and disciples did not call Him by that name, for He was a Hebrew from the tribe of Yahudah/Judah. A quick search lead me to a handful (or more) of names that was thought to be the true, personal name of our Savior. I saw Yeshua, Yeushua, Yahshuah and so on. I’ll admit through complete frustration and feeling like this was W-A-Y over my head (after all, I do not know Hebrew), in ignorance and because it seemed to be the most common, I decided His name must be Yeshua. I used it every now and then in prayers and with family, but I never truly felt like I had searched far enough to find the truth and was reluctant to completely replace the name Jesus with Yeshua. I think there was a part of me that didn’t even fully believe it was important and since everyone I’ve ever known or heard of (in my lifetime anyway) called on and was saved by the name Jesus, it HAD to be ok to continue using this name. But as He always does, The Father led me right back to searchin for His true name and that of His Son, with this passage… “I have come IN MY FATHERS NAME and you do not receive Me, if another comes in his own name, him you would receive.” John 5:43. Even without further study, you can clearly see that the name of The Son Yahusha contains the name of The Father Yahuah. But, lets continue to dig a little deeper. Why is it important that we know the personal, covenant names of The Father and The Son, our Messiah? Because there are also countless passages that speak of knowing and not forgetting His Name. As well as scripture that speaks of the only name in which there is deliverance and by which we need to be saved. It is also important to note that not one scripture refers to a Name: they all refer to The Name, My Name or specifically gives their covenant names. The word ‘the’ is a definite article, while the letter ‘a’ is a preposition. When we use ‘the’, we are talking in specifics not in general. Another very simple way to look at it is would you want someone calling YOU by a name that is not your own? How would you like it if you told someone your personal name that you were given at birth, picked just for you by your parents and yet they continued to call you by a different name? So, how much more should we desire to call our Heavenly Father and His Son, The Messiah – Our Salvation by their personal, covenant names? Especially after Yahuah tells us just how important it is that we know and call on His name and the Name of His Son, Yahusha. So, how did we end up with the name Jesus? The name of Jesus is a mis-translation and mis-transliteration of the Aramaic name Yeshua, which came out of the time of Babylonian captivity when the Hebrew name Yahusha was changed and shortened. The Hebrew root YESHU means: to blot his Name out or “May his Name and Memory be Obliterated”. This Name Yeshua was then translated into Greek, which came out a Feminine name Iesoua, which was then changed to Iesous to make it masculine. This name was then translated into Latin under the name Iesus (King James 1611 version), which was later changed again into the name Jesus only about 500 years ago when the letter “J” entered the English Language. The letter “J” did not and still does not exist in Hebrew today! Ancient Hebrew, before Babylonian captivity = יהושע / Yahusha, translates in English as Yahusha Strong’s: 3091 says Yehoshua, which means “Yahu is Salvation or Yahu Saves. Modern Hebrew = ישוע / Yehsua, Greek= Ιησούς / Iēsous; Latin = Iesus (Hesus), English = Jesus. Remember the Hebrew root Yeshu means: May his Name be blotted out and may his memory be remembered no more! How did the name’s change during the Babylonian captivity? Masoretic points, or vowel points (Nikud) were added to Abary (Hebrew), or as the system is now called, Masora from MASSOREH (“tradition”), and MASAR (“to hand down”). The rabbis who busied themselves with the Masorah were called Masoretes. They were also the inventors of the Masoretic points, which are supposed to give the wrongfully called vowelless words of the Scriptures their true pronunciation and meanings by the addition of points representing vowels to the consonants. The Masoretes were groups of mostly Karaite scribes and scholars working between the 7th and 11th centuries, based primarily in present-day Israel in the cities of Tiberias and Jerusalem, as well as in Iraq (Babylonia). Each group compiled a system of pronunciation and grammatical guides in the form of diacritical notes on the external form of the Biblical text in an attempt to fix the pronunciation, paragraph and verse divisions and cantillation of the Jewish Bible, the Tanak, for the worldwide Jewish community. The Masoretes devised the vowel notation system for Hebrew that is still widely used, as well as the trope symbols used for cantillation. It is believed the Nikud were used by Masoretic Scribes to hide the Father’s real name in the belief that it was too sacred to be said aloud! The Babylonians had many God’s and would not utter their names, considering them too sacred and would mock the Hebrews when they were saying their Father’s name aloud, and so over time the Hebrews adopted the concept of making the Father’s name Sacred also and began to find ways to cover up the original pronunciation, and began to add vowel dots under the letters which had the power to alter any word’s pronunciation! So if we remove the Vowel Dots we can effectively correct the Pronunciation. We then get Yahuah instead of Yahovah! The ancient Hebrew and the Hebrew spoken by The Messiah did not have vowel points. They were added to the Hebrew (Abary) text. Ancient Hebrew for the name YHUH before the vowel points were added to become יהוה which is considered Modern Hebrew. Ancient Hebrew for the name Yahusha before the vowel points were added to become יהושע which considered Modern Hebrew. God is not YHUH’s name. The Most High and creator of the universe has a name, but “God” isn’t it. “God” is a title or term of who He is. Just like “Human being” is not your name, “Human being” is what you are. You also have a name. Whether it is “Rick”, “Michele”, “Chris” or “Linda”, you have your own personal name. So does God, His name is YHUH (Yahuah or YAH). There are numerous other pagan deities or “God’s”, of which I will not go into all of them here but will briefly show how using the generic title of “God” for our Heavenly Father may truly be a insult and displeasing to him. There is a prophecy for the end-time given in Isaiah 65:11 wherein our Mighty One warns of the apostasy of His people, “But you are those who forsake Yahuah, who forget my set-apart mountain, who prepare a table for Gad, and who fill a drink offering for Meni.” All commentators agree that Gad is a pagan deity, and so is Meni. Gad is usually interpreted as the well-known Syrian or Canaanite deity of “Good Luck” or “Fortune”, and Meni the deity of “Destiny”. This Gad is written in the Hebrew as GD, but the after the Massoretes added vowel points, adding an “a”, it gives us “Gad”. However, we find other references in Scripture to a similar deity, if not the same one, also spelled GD in the Hebrew text but this time vowel – pointed to read “Gawd” or “God“, in Joshua 11:17, 12:7, 13:5, where we find: “Baal-Gawd” or “Baal-God“, according to the vowel – pointed Massoretic Hebrew text. This Baal-Gawd or Baal – God was obviously a place named after their deity. And in Jeremiah 23:27 we see that His name was forgotten for Baal. This is also the case for the title “Lord” as the title of Lord transliterates into the name Ba’al. Because of the Jews superstition that it was too holy to pronounce the name YAHUAH, they replaced every occurrence of the name YAHUAH (over 8,000 times in scripture) with the title LORD in keeping with their Babylonian captors whose god was also the LORD god Ba’al. “Lord” is used as a title for numerous other gods or deities. Even satan is called Lord by the evil ones of this world. If we love Him, we will love His Name. If we love His Name, we will not destroy it (Deuteronomy 12:3 and 4), we will not forget it (Jeremiah 23:27), we will not substitute it with a title, a generic name, or a name which has been and is used for a pagan deity (Exodus 23:13). So what do we call The Father when we see these names that have been translated and replaced in error? 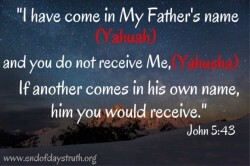 There are several other names commonly used for The Father and The Son such as Jehova and Yahweh which are incorrect. As stated above, there was nor is not a letter “J” or the sound of the letter J in Hebrew so Jehova can not be correct. The same goes for the letter “W” in Yahweh, there is no such letter in the Hebrew language. There are a multitude of websites in which you can study more in depth the Hebrew language and the history of the Paleo Hebrew, Modern Hebrew and the many ways Elohim’s name has been changed in order to cause confusion among His followers and believers of His Son, Yahusha. This post is but a tiny piece of the puzzle in the deception by the evil one, regarding the most powerful name above all names YAHUAH! And if we love Elohim, we keep His commandments (1 John 5:3). I truly believe this is just as the rest of the truth we find when we seek Him, once we are shown and we know the truth we are held accountable for it. In this day and age, there is a plethora of information at our fingertips….but the truth is, we have to desire to find it. We must study to show ourselves approved unto Elohim (2 Tim 2:15. I have found a few Bible versions that have translated as close to the original Hebrew text as at this time is possible. They render the proper Hebrew names for The Father and The Son as well as the Prophets and names of the Books. It is an incredible blessing to have such resources at our fingertips. I love technology, but I personally have also been convicted lately that our family should start to gather hard copies of books that are important to our learning and especially sound/uncorrupted versions of Elohim’s Word. Below you will find the links to the websites to purchase the hardcopies or download e-versions if they are available.